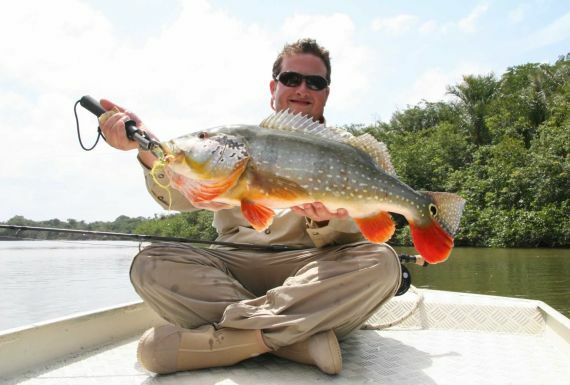 The fishery on the Agua Boa River is in our fifteen years of exploration the best we have encountered. It is perfectly suited to fly-fishing. When at normal levels, the water is so clear, that most strikes are visible and a good percentage of your days will be spent sight fishing. It should be noted, however, that the sight fishing opportunities are dependent on light and water levels. Many anglers visit the Agua Boa Amazon Lodge strictly to sight fish for peacock bass, arowana, pacu and a host of other jungle species. While it does limit the productivity of your day, the experience of sight fishing to peacocks on white sand is we think something no fly fisherman should miss. The Butterfly Peacock is the most numerous in the system. Butterflies are aggressive takers on poppers and 3-4 inch streamers. They are great fighters and jump often. They range between 2 and 8 pounds with approximately a 3 pound average in the system. Butterfly Peacocks provide plenty of action between shots at larger fish. The Spotted and Temensis Peacock Bass are both a totally different beast. These two species are the largest of the peacocks and can attain weights of 25 pounds. These Peacocks are some of the most aggressive game fish on the planet. They wander in schools of up to 40 fish and feed together working bait like bluefish. It is difficult to describe a school of these large peacocks in full feeding frenzy. Needless to say that 1 pound baitfish are flying everywhere in a desperate attempt to escape. In many cases the baitfish will jump onto to dry land to escape. If you can get your fly into the action, the results are spectacular: a ferocious take, a blistering run, a jump and or a run into structure are just a few of the possible obstacles you might be confronted with. The other jungle species are also well worth pursuing. The arowana looks and acts a lot like a tarpon. They have huge scales, are air breathers, spooky and wander through the river in schools in search of baitfish. Arowana are a surface oriented fish. They are very visible and provide exciting sight casting when conditions are right. Beware they are spooky and difficult to hook and land. Arowana have a split eye that allows them to see above and below the water. As a result they are very sensitive to false casting and an unnatural movement to the fly. Smaller patterns stripped slowly and in short increments seem to be the most successful. Remember watch the fish and try to keep your fly as close to the fish as possible when retrieving your fly. Arowana have a jaw similar to tarpon and require a hard strike. They are an aerial fighter and good runner. Arowana average 6-10 lbs, but can reach nearly 15 pounds. Pacu, also known as the silver dollar, are a fun fish and can be taken on trout patterns like Royal Wulffs, caddis and flesh flies. They are shaped like a permit and in the Agua Boa they reach weights of 5 pounds. In front of the camp there are pods of hundreds of pacu rising nightly. 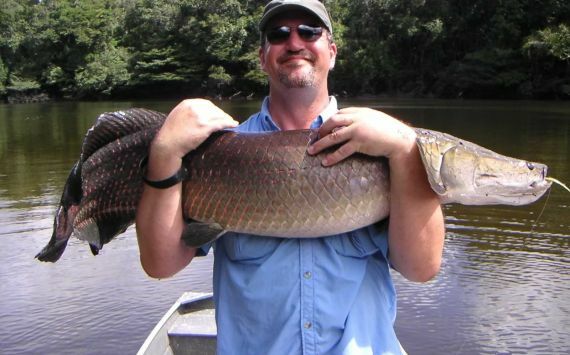 Pirarucu, the giant tarpon of the Amazon, reach weights well in excess of 200 pounds. These fish look and act a lot like tarpon, but are so smart and probably one of the most difficult game fish on the planet to land on a fly. We have landed over 20 on the fly. They are acrobatic and excellent fighters. It is tough to describe the excitement of seeing a six foot fish and trying to manage a cast to one. It should also be noted that Agua Boa is the Amazon's first fly-fishing only peacock bass lodge. Single barbless hooks and catch and release are required of all guests. 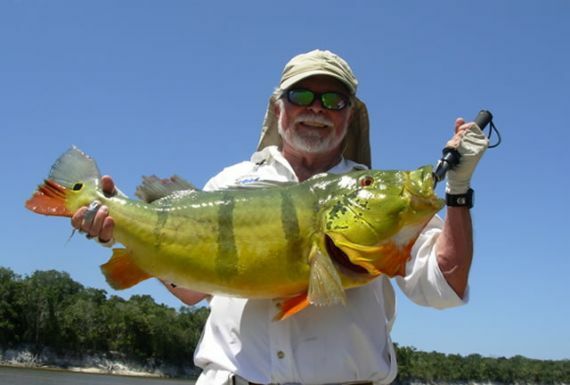 The Best of Peacock Bass Fishing in the Amazon of Brazil!